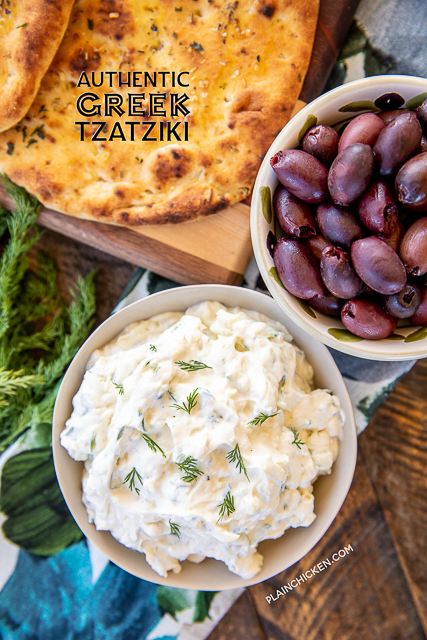 Authentic Greek Tzatziki - recipe from a Greek restaurant in Poros, Greece! SO simple and it tastes amazing! Goes great with lamb, pork, meatballs, gyros, chicken and bread. Greek yogurt, garlic, salt, pepper, cucumber and olive oil. Can make in advance and refrigerate 5 to 7 days. Great for a quick snack or parties! What is Greek Tzatziki Sauce? 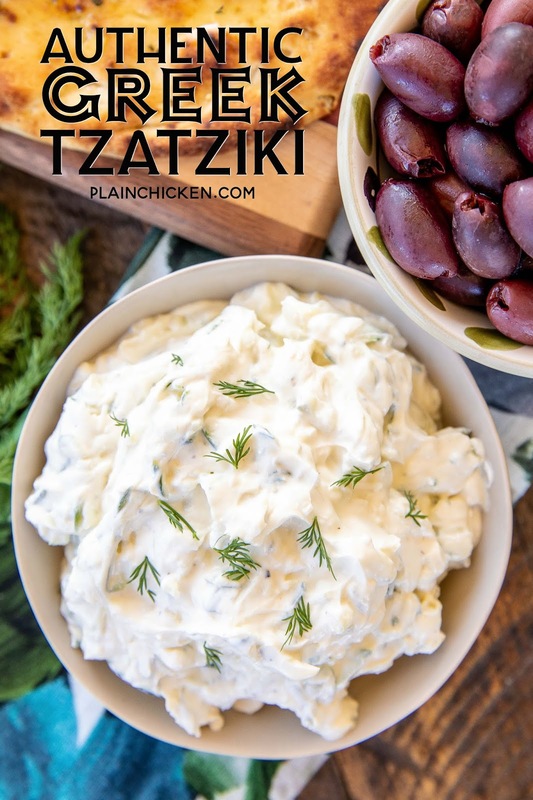 I got this recipe for Authentic Greek Tzatziki sauce on my trip to Greece. We had an amazing dinner at The Odyssey in Poros, Greece. The owner gave me a small recipe book with some of her traditional Greek recipes. This Tzatziki sauce was in the book and I couldn't wait to give it a try! What is Greek Tzatziki Sauce? Greek Tzatziki Sauce is a greek yogurt based sauce/dip with grated cucumbers, garlic, olive oil, salt, and pepper. Some recipes may also contain dill. How Do I Make Greek Tzatziki Sauce? Authentic Greek Tzatziki sauce is incredibly easy to make. It took me about 10 minutes from start to finish. Just mix together the Greek yogurt, grated cucumber, garlic, olive oil, salt, and pepper. After everything is mixed well, refrigerate a few hours to allow the flavors to develop. It will keep about 5 to 7 in the refrigerator. The most important aspect of this recipe is squeezing out all of the liquid from the cucumber. I grated the cucumber and then squeezed it with my fist. Once I had squeezed most of the liquid out, I wrapped the cucumber in paper towels and gave it one last squeeze before adding it to the Greek yogurt. Make sure to buy plain Greek yogurt for this recipe. I used full-fat Greek yogurt in my Authentic Greek Tzatziki. I haven't tried this with low-fat or fat-free Greek yogurt, but I am sure it would be fine. 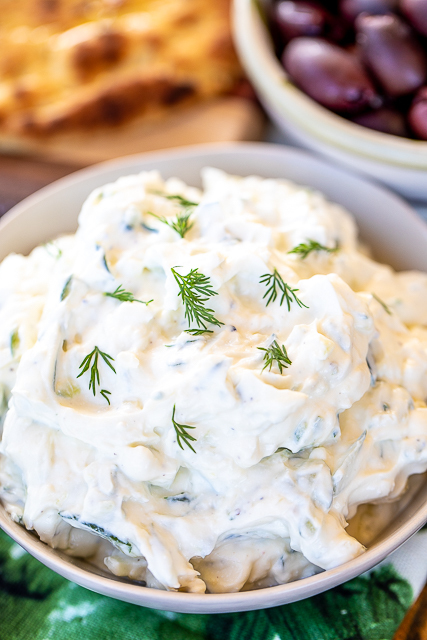 What to Serve With Greek Tzatziki Sauce? 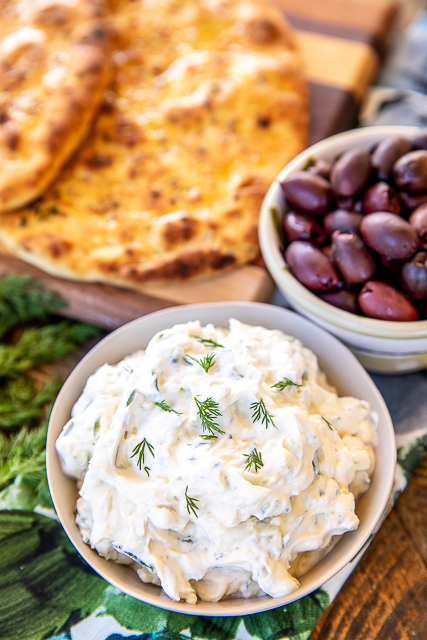 Tzatziki sauce is traditionally served with just about everything in Greece. I think we had it with every meal! Lamb, meatballs, chicken, gyros, bread - everything. I made some naan bread to go with our Authentic Greek Tzatziki. I brushed the naan bread with olive oil. Next, I sprinkled it with some garlic and dried oregano. Finally, I drizzled some honey on top of the bread and baked it for about 5 minutes. SO good!! Squeeze the water from the grated cucumber with your hands or paper towels. Combine the Greek yogurt, grated and squeezed cucumber, garlic, olive oil, salt, and pepper. Refrigerate at least 2 hours to allow the flavors to develop. Stir again before serving. Garnish with fresh dill if desired. Do you peel the cucumber before grating it? No, you do not need to peel it first. I could eat tzatziki EVERY DAY!!!! YUM!